Will help maintain a healthy pond environment and reduce the threat of parasitic disease in pond water. 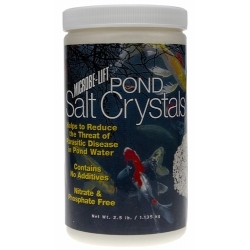 Microbe-Lift Pond Salt Crystals added to your pond water can be effective in helping to maintain a healthy fish environment and, in proper dosages, has proven to be helpful in reducing the threat of parasitic infestations in the pond. Microbe-Lift Pond Salt Crystals will temporarily block the toxic effects of nitrite, and by initiating the production of a thicker slime coat on the fish's body surface, helps to promote a stronger immune system and reduce stress. Caution - Do not overdose. When adding salt to ponds that contain aquatic plants, be especially careful in monitoring salt concentration as salt can be a toxic effect on certain plants. Before adding salt to your pond, remove any zeolite products being used. Directions - Salt will not evaporate from your pond. After testing your pond water with a hydrometer, you can add salt with your regular water changes. We recommend mixing salt and pond water in a bucket, and then spreading the slurry around the perimeter of your pond. Be careful to avoid direct contact with pond plants. For Stress Reduction: Use Microbe-Lift Therapeutic Salt For Quarantine Tanks containing added electrolytes and Allantoin, which accelerates wound and fin healing.